This is the return of one of Kinderpack's most popular prints. Colors of grey, avocado, turquoise, aqua, cream, magenta, and a grey background. Paired with Graphite straps and white Koolnit. 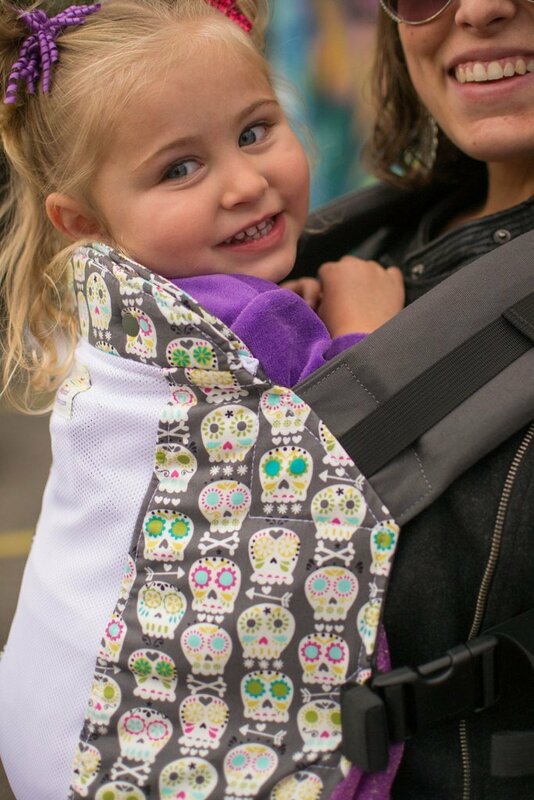 The Kinderpack is a totally different kind of soft structured carrier! The first of its kind! It features a uniquely styled shaped and contoured body panel, that creates a rounded seat for baby's bottom. It molds to your child so comfortably and cradles their legs in upward comfort by fostering the recommended "bottom-lower-than-knees" seated fashion. This puts baby in proper positioning. The Kinderpack is one of the widest carriers available, making it very comfy for baby. No legs dangling! The standard size is perfect for those who want to buy once, keep forever. The toddler size is the best choice for your little one that is approaching 30 lbs or 32 inches, and wants to be arms in. Standard is the choice for most people- the standard will fit up to 3 years old/4T. This is the size to buy if you want to buy one carrier without having to size up later. Toddler: 18"h x 19"w- ages 18 mos-4+ yrs (starting at 25 lbs/32") there is a huge difference between the standard and the toddler- please be aware that the minimum recommended size is just that, and it may still be too large for a child who meets those minimums. All Kinderpacks have strap length adjusters to shorten the shoulder strap if needed. Straps and Waist: The straps are slightly contoured with an integrated, quick adjust, chest strap and strap length adjusters for the "Perfect Fit". The shoulder strap is generously padded for optimal comfort and is shaped just enough to avoid the dreaded underarm rub. Hood: 2 piece lined hood that is aviator shaped. Very cute! The hood features the completely exclusive 'stuff and snap' hood design. Simply stuff the hood inside the body when not in use and snap the 2 piece structured headrest together! This also creates a pocket for soft items such as a diaper. Very convenient! You don't have to choose between a carrier with a headrest or a hood- the Kinderpack has both! The Kinderpack hood also features a buckled hood tie. *Note: Kinderpacks with mesh of any kind have flat, rectangular hoods instead of the shaped hood. Body Panel: The 3 piece shaped contoured body is the first of its kind. The curved pieces form a bulbous seat pocket for baby's bottom that curves in at baby's back. This exclusive shaping promotes proper support and follows the shape of their little bottoms and backs, making their wearing experience as comfy as it can be. There really is a difference! Structure: As with all Kindercarry baby carriers, canvas is the main fabric used for straps, body, and internal layers. You may infrequently see the Kinderpack made with twill or corduroy, but all stress points are reinforced with canvas where needed. These carriers are some of the most supportive and sturdy on the market. All structural components are made from either 8 oz Brushed Canvas, 10 oz Organic Canvas, or 9-10 oz brushed bull denim, and paired with a fashion print for style. Each Kinderpack has an internal layer of 8 oz. canvas inside the body. Shoulder straps, webbing, and waistband are reinforced with bar tacking internally and X or V box reinforcement you can see on the outside at all joining points. 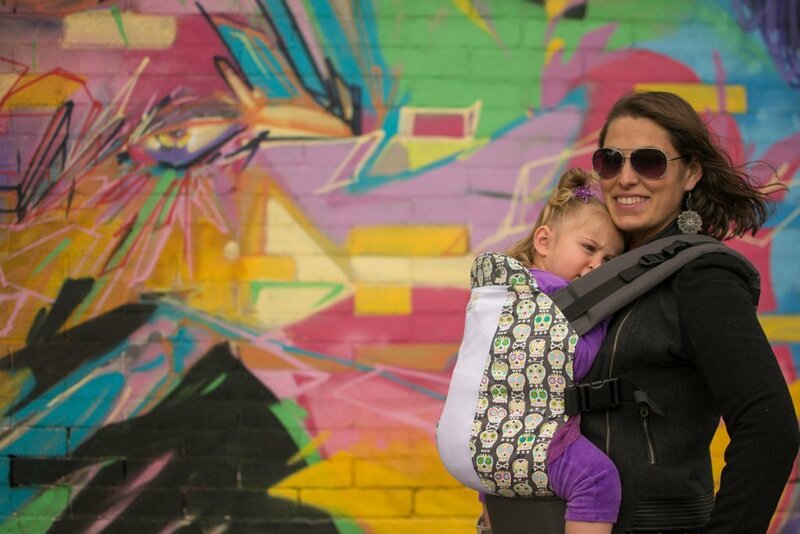 All of these details make for an extremely strong and durable baby carrier.